I am appearing on the Dr. Oz show this week as a guest. No, I did not photoshop myself in the above photo. The episode will air on Thursday, December 10th and the promotional video below actually has me in it (I am in the blue dress)! Check it out: Dr. Oz and Snack Girl, Thursday, December 10th. Dr. Oz was sweet enough to offer to be in a photo with my family. You see my husband, Matt, and my son, Alex, and daughter, Ruby above. We all went to NYC to tape the episode a couple of weeks ago. I was featured because of my apple peeling prowess and it was SO much fun. I can tell you that being on national television is crazy. The entire atmosphere feels like barely controlled chaos. I was thrilled to be in a segment about a healthy food (apples) and I hope that my appearance brings smiles to peoples faces during this stressful season. My interaction with Dr. Oz was only a few minutes, but in that time he did seem as genuine as he appears on TV. I hope you will get a chance to watch it and I PROMISE it will make you giggle. Wow Lisa, that is awesome! I will definitely tune in to see you on Dr. Oz! That is fantastic! I will tape the show for sure. The Canadian Gals will be watching!! Love your humour!!! Congratulations Lisa what an amazing accomplishment!! Awesome Lisa!!.. How exciting for you and your family. I had my morning laugh when you said you were the one in the blue dress,,,LOL..I love your sense of humor... I will certainly tune in and watch and just want to say you have a beautiful family..
Way to go Lisa! Handsome family! I love Dr. Oz as he seems so "regular" and while he offers advice and opinion, he's not "preachy". I'll have to double-check what time show is on in Boston. Congratulations Lisa!! Isn't this your 2nd time on national TV this year? And both times talking healthy snacks...I love it! May I say I am so proud of you. Even with all the new exposure you've been getting over the years, you still have that great sense of humor and seem to be very well grounded, that's AWESOME! I will be sure to watch you exhibit your apple peeling superpower this week. Your family is lovely. Congratulations again & thank you for staying you. Oh, wow! How fun is that! Will be watching! Awesome Lisa! Congrats! I plug you all the time in my small business and you give me the strength to continue! Love the family pic! So happy for you !! Wow what an awesome experience for you and your family! Congrats! I'm so happy for you Lisa that you're getting some recognition you differently deserve it. I just wish it was another show. Dr. Oz has never been my favorite. I have seen some weird things he talks about and seems like he's always on the weight loss kick. How to get skinny. Every show and magazine write up is always on that subject. With weird things to eat and drink. I talk with a lot of different people as part of my job and they will tell me all about Dr. Oz's new african herb or shake to get thin, just examples. I wish he would be more sensible and talk about just getting healthy. Putting the focus more on that. I never have found him genuine, I feel he's more about ratings. I'm sure to get some flak, but thats alright. I've always believed in you and what you stand for. You're real and down to earth on your advice. Now the world will know. Congratulations. Congratulations to You Lisa! Looks like a fun episode, no doubt with you on it. I will be watching. I still Love Dr. Oz, even if he did get some bad press. I think he truly means well and is trying to help people become healthier. You and him are a great match. How exciting! My DVR is set! 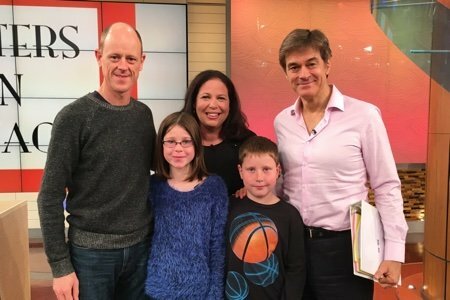 Love the photo with your family and Dr Oz! Next years Christmas card? Congrats! Setting my DVR to record so I don't miss it. I really enjoy all your articles and recipes and your common sense approach to healthy food. Thanks for sharing. Yay! We get to watch Snack Girl in action! I'll be there Lisa! The more exposure you get the better! By the way, you have a great looking family! I agree with Ruth. As a dietitian I hear from patients about items he promotes that may be based on limited and/or questionable evidence. You may know that physicians usually have little or no formal nutrition education. That's awesome! Congratulations! I bet your family was so excited and proud. This is so exciting, Lisa! Everything Frances just said! How great this is for you, I am so happy for you, Lisa. Congrats, hope you had a great time and a good message gets out. I was contacted last week to appear on Dr. Oz but it was on their show about hidden eating disorders resulting in weigh loss. I had to decline, I lost all my weight eating healthy while I was sick and told them so. I want to get my message out but not associated with something negative. Very funny to watch especially when the apple peels fly every where. Watch Dr. Oz all the time. Doesn't mean I believe everything he says but there are always little things/tips that I can use. That's awesome I'm so excited for you! @Janet - I have had a lot of experience talking in front of large groups of people. I used to be a TA in Graduate School and had classes with 500 people. The key is to focus all of your attention in the moment and take a deep breath from the core of the earth - forget the camera, audience - and be yourself. Also, you decide you are going to be great and don't allow your brain to pitch you any alternatives. The minute you start to think about screwing up - you go down the path of fear. Also, it is over before you know it so I like to think about what else I will be doing that day to distract me. How fun and how important?! Great news, Lisa! Great - congrats! I'd love to meet him. I'm sure you had fun taping! Can't wait- my DVR is set, Lisa! Congrats on being on his show! CONGRATULATIONS! I've been to his show several times and even did some little segments for between commercials. Very funny....... why didn't you promote Snack Girl? @Henriette - The show wouldn't let me for this segment. My goal is to get on again and do the Snack Girl thing.